« Homepage / Food and Healthy Eating / Recipes / "Eggs À La Créme"
I’ve been served many exotic egg dishes in my travels including the thousand-year eggs of China. However, I can think of no better egg dish or one more beautifully presented than these Eggs à la Crème. This elegant dish was first created by Maugie Pastor of T’Frere’s House in Lafayette, La. Eggs à la Crème and a cup of hot black Cajun Coffee (see recipe) is the perfect start to any day. In a cast iron skillet, melt butter over medium-high heat. Add onions, celery and bell peppers. Sauté 3–5 minutes or until vegetables are wilted. Blend in flour then add ½ cup whipping cream. Stir until thickened white sauce is achieved. Season with salt, pepper and Creole seasoning. Remove from heat and set aside. In a large mixing bowl, combine eggs, thyme, basil, garlic, parsley, green onions, remaining whipping cream and prepared white sauce. Using a wire whisk, blend well to create a whipped egg mixture. Season with salt, pepper and Creole seasoning. In a large cast iron skillet, heat oil over medium-high heat. Add crawfish and sauté 2–3 minutes. Add whipped egg mixture. Using a spatula, stir eggs gently until scrambled but not dry and overcooked. 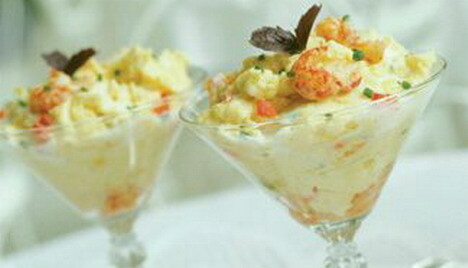 Spoon eggs into a stemmed champagne goblet and garnish with chopped parsley and paprika. Serve with toast. Here you can write a comment to the post "Eggs À La Créme"